Perspiring, more commonly referred to as sweating, is a process of great importance to the properly functioning human body. Distinct from sweat glands whose primary purpose is temperature control (eccrine), another more specialized type of sweat gland (apocrine) - such as those found in the armpits - secretes substances prone to bacterial growth and the generation of body odor. 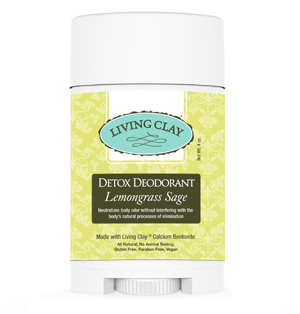 Unlike antiperspirants, which block sweat production, Living Clay® Detox Deodorant is a formula of natural and organic ingredients designed to neutralize body odor, eliminate odor-causing bacteria, and absorb wetness. Our Detox Deodorant will help keep you feeling dry all day while also promoting the removal of toxins. In contrast, antiperspirants designed to prevent sweating are also blocking your body's secretion of toxins. Even more alarming, many also include caustic ingredients like processed aluminum, parabens, and other chemicals that may be linked to Cancer.